my bare cupboard: Matcha tiramisu cake "
Tiramisu literally means " pick me up / wake me up " In Italian . It is made with savoiardi or ladyfingers dipped in coffee liqueur spiked coffee and layered with mascarpone , eggs and sugar mixture then dusted with cocoa powder ( wiki ) . 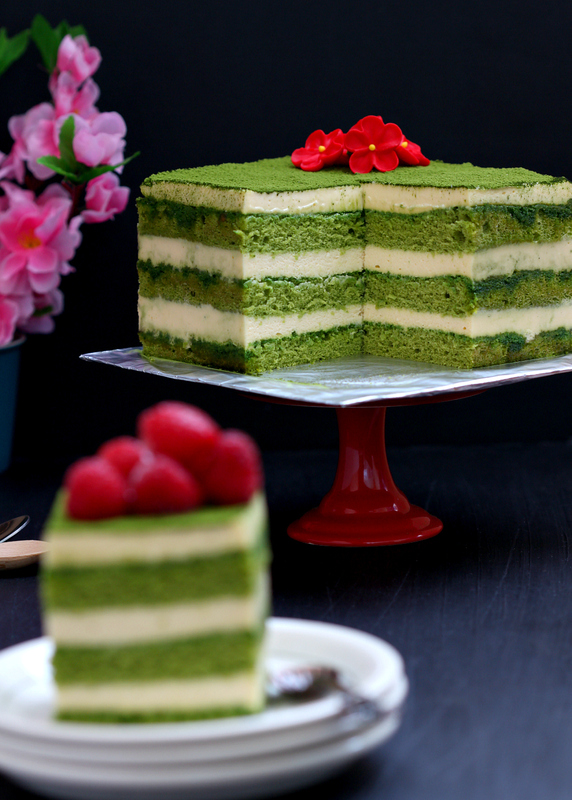 This version is more like an east meets west dessert , combining the popular Japanese matcha powder and the Italian mascarpone . Uji matcha is a finely-milled green tea powder , the one I used here is the less expensive baking/cooking grade , it has a nice bright green color and less bitter than regular green tea powder . If you don't have the mould , use some drinking glassess or use a glass / ceramic baking dish . Too lazy to bake a sponge cake ? Use store-bought ladyfingers . You can even add some matcha powder to the cheese mixture - there is no such thing as too much matcha , right ?! 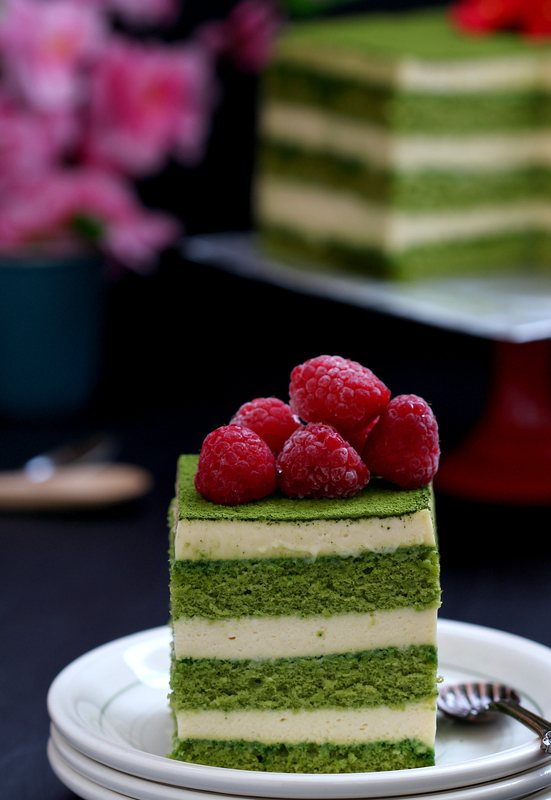 Love matcha and cake ?! * Scrape the brown top of the cake ( optional ) with a pairing knife . 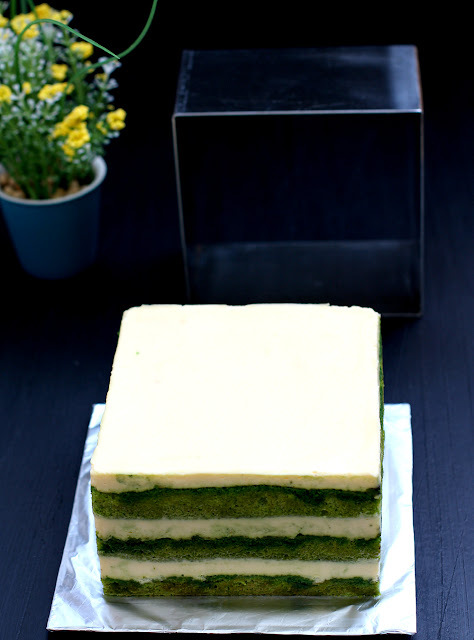 Use a 5-inch mould to cut three 5-inch matcha sponge cake , leave the last one inside the mould and transfer into a cake board . Set aside . * Place sugar and water in a small saucepan , cook over medium-heat until sugar is dissolved . Transfer syrup into a small bowl , add in matcha powder and stir until well-combined , Set aside . * Prepare a hot water bath . Combine yolks , sugar and milk in a small mixing bowl , place bowl on top of the prepared water bath , use an electric beater to beat the egg yolk mixture until light and fluffy . Set aside . * Combine milk and gelatin in a small bowl , place in a hot water bath , stir until gelatin is dissolved , keep warm . * In a large bowl , combine cream cheese , mascarpone and condensed milk , beat on low speed until combined . Adjust to high speed and beat until fluffy . Add in the whipped cream and beat until mixture is smooth and creamy . Add in the sabayon , orange liqueur , lemon juice and gelatin mixture , mix until just combined . If the mixture is a bit runny to pour , chill in the fridge for about 10 minutes so that cheese mixture won't leak into the sides of the mould . Stir mixture before pouring . * Brush the first piece of matcha sponge cake with matcha syrup . Pour in sufficient amount of cheese mixture on top and use a small pastry scraper or a spatula or spoon to smooth the surface . Place the 2nd piece of cake , brush with syrup and top with another layer of cheese mixture . Place the last piece of sponge cake , brush with syrup and pour in remaining cheese mixture . You can either guesstimate the amount of cheese mixture you pour in each layer or divide mixture into 3 . * Chill tiramisu at least 4 hours before unmoulding . * Run a hairdryer over sides of the mould . Place tiramisu back into the fridge for about 30 minutes . 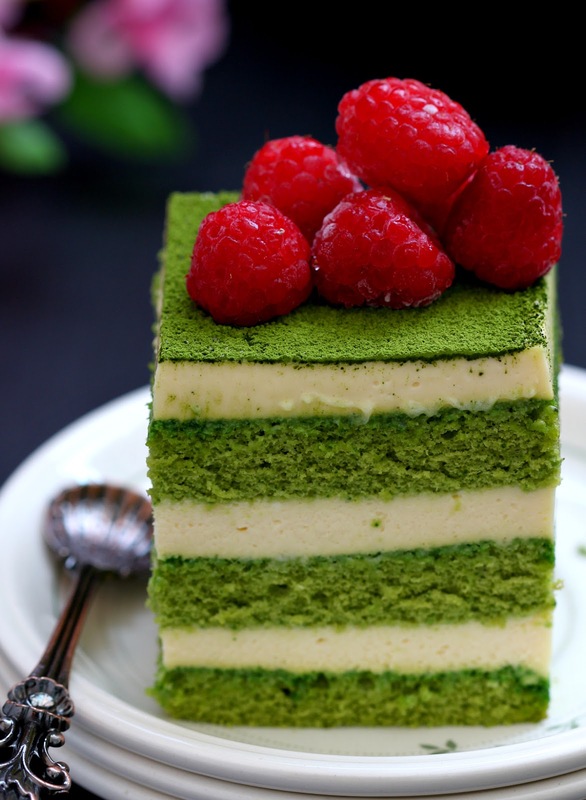 * Sift in icing sugar on top of the cake then sift in the matcha powder or you can combine both sugar and matcha together then sift them on top . 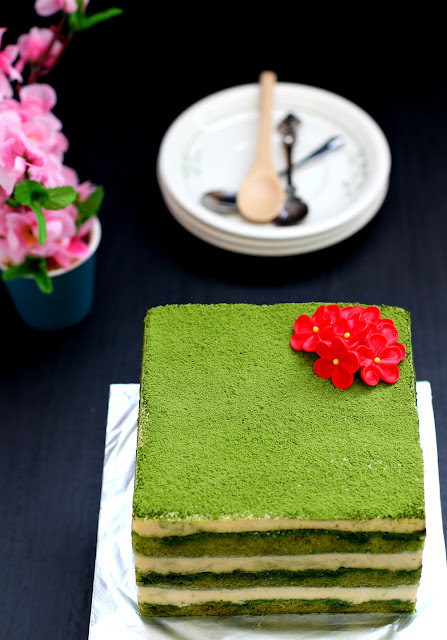 * Cut matcha tiramisu into 4 or 6 pieces . Add in some raspberries , if available , and serve immediately . Absolutely beautiful! I love this east-meets-west Italian classic. Well done, Anne. Lovely! And this nice flowers decoration! This tiramisu looks so beautiful!